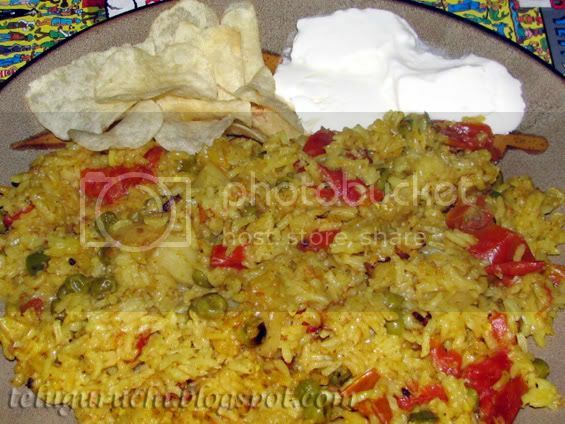 Here is another delicious rice item that was prepared using Yellow Squash. One of our friends has given us lot of these yellow squashes. I made daal with it once, curry once and finally this yummy rice item. As we all know, squash is a healthy vegetable that has very low calories. It is rich in many nutrients and vitamins. If interested to know more about the health benefits of squashes, check this site: WH Foods. Peel, cut the end and grate the yellow squash. Keep aside. Wash and soak rice in plenty of water until all the other things are made ready. Heat oil in a pan and add all the other ingredients except rice and sauté well for some time. Then remove the water from the soaked rice and slowly add to the pan. Stir well. If using pressure pan, add water (3 cups) directly to the pan, adjust salt and leave it on the flame until 3 whistles. Then turn off the flame and let the pressure go out. Mix well. If using electric rice cooker, then add the contents of the pan to it, adjust salt and let it cook. When done, mix the rice well. 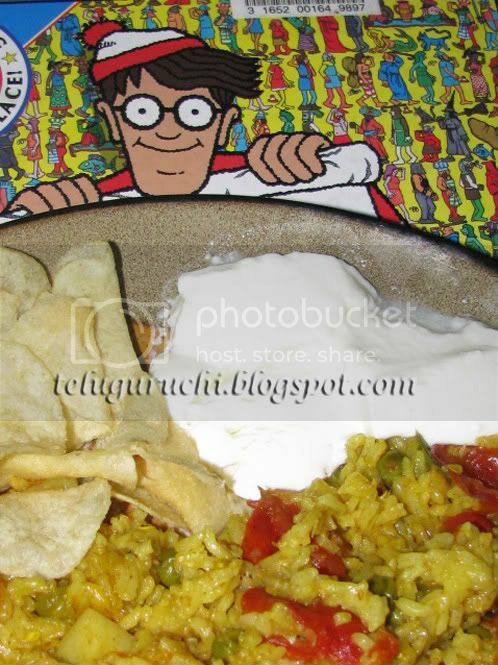 Enjoy the steaming hot rice with some potato chips or raita or just plain yogurt. Lovely looking rice recipe. Looks so good. So colorful. YUM! Great way to welcome fall the Indian way! Looks delicious, Uma. My squash plants have completely wound down by now, but I would love to try this sometime. Looks delicious & colourful!! !Never tried squash yet..will give a try..Thanks for sharing. Seems so novel Uma. Never thought of using the squash in the pulav kind of dish. looks delicious and aswell the photography. Very inviting. That rice dish looks delicious. Wow! Hot rice! It steamingly looks superb! Very innovative and interesting recipe. Never tried rice dish using Yellow squash, have to surely try this out. looks delicious and sounds good with the squash..
Definitely a delicious and new combination of rice..looks very colourful and yummy Uma! Have never tried Squash at all.. This one calls for a try!! The presentation is lovely. Loved your last pic,Uma!Healthy one and very tempting! Looks so colourful and Yumm... Nice entry! Yellow squash rice looks very colourful, delicious and tasty. Very beautifully presented with mouth watering picture. Squash rice another delicious treat! Never tried a rice with these squash Uma. Looks very inviting. Must try! And I would like to share some awards with you dear. Do pick up from my blog. looks too good uma...its new dish for me..